Comments: These small black-headed gulls nest in prairie marshes in the northern Great Plains. Colonies may contain hundreds of thousands of individuals. Colonies may shift locations between years as water conditions change. Floating nests are built of bulrushes, cattails and other vegetation. Franklin’s Gulls often share their colonies with nesting ibises, egrets, terns, grebes and coots. There has been a general southern and western expansion into the Great Basin over the past 80 years. As with other species of waterbirds, colonies are vulnerable to human disturbance during nesting and may be abandoned if disturbance is excessive. 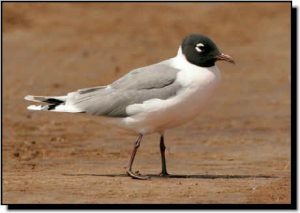 Franklin’s Gulls are most likely to be confused with Bonaparte’s and Laughing gulls.